Looking for a Tesla Solar Roof referral code to get an extended 5 year warranty? To get a 5 Year extended warranty on your Tesla Solar Roof! What is a Tesla solar roof? A Tesla Solar Roof powers your home by turning sunlight into electricity. With an integrated Powerwall battery, energy collected during the day is stored and made available at any time, effectively turning your home into a energy efficient/sustainable abode. No more unsightly solar panels to take away from your homes beautiful architecture as Tesla solar roof tiles are aesthetically pleasing as well as durable. Teslas glass solar tiles are so durable they are warrantied for the lifetime of your house, or infinity, whichever comes first. To get the most out of your Tesla solar roof, you will want a way to store the electricity generated by the solar tiles. Consider integrating the Tesla powerwall into your home in order to maximize the storage and space requirements needed for a solar system. Concerned about how well the Tesla solar tile system will hold up to the elements? Have no fear as the tiles are rated well extremely well for hail, wind, and fire resistance. Owners can give five friends a 5-year extended limited warranty on a new solar energy system installation, and will be eligible to receive referral awards. Receive $400 cash or $750 in credit per each installed referral. Credits are valid for 12 months from the referral installation date and can be used toward new Tesla products or accessories. Store energy for future use and provide backup power with this red, limited-production Powerwall 2 home battery. By using a Tesla solar roof referral code on purchase, you will receive a 5-year limited warranty on your installation, theres nothing not to like! 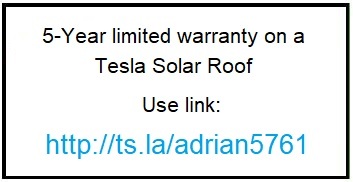 To get a 5-Year limited extended warranty on your tesla solar roof!